Data from two ESA missions combine in a new view of the peculiar supernova remnant W44. The filamentary shell-like structure, detected by the Herschel Space Observatory at far-infrared wavelengths, is filled with hot gas that shines brightly in X-rays, as seen by the XMM-Newton X-ray Observatory. This composite image highlights how the complex morphology of this remnant has been shaped by its interaction with its parent molecular cloud, the star-forming region W48. The most massive stars end their life cycles as supernovae – spectacular explosions that release enormous amounts of energy and matter into the surrounding interstellar space. These powerful events leave behind supernova remnants, expanding clouds of hot gas and highly-energetic particles that keep shining brightly across the electromagnetic spectrum for thousands of years after the stellar explosion. Supernova remnants display a variety of shapes and features that are often heavily influenced by the environment into which the ejected material is expanding. The supernova remnant W44 (SNR W44) is a prime example of the interaction between the remains of a supernova and the dense interstellar material around it. The composite image from Herschel and XMM-Newton illustrates that SNR W44 consists of an asymmetric expanding shell about 100 light-years across that is filled with hot, X-ray emitting gas. Around 10 000 light-years from us, SNR W44 is located in the molecular cloud complex known as W48, a rich star-forming region where a multitude of massive stars are being born. Annotated composite Herschel and XMM-Newton image of SNR W44. 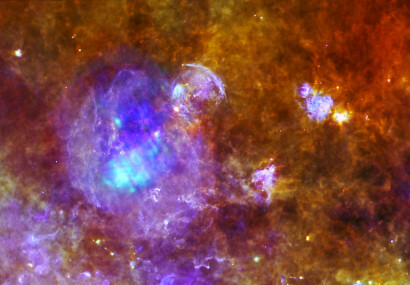 The Herschel view of SNR W44 shows particular features of the supernova remnant interacting with its parent molecular cloud: just above the centre of the image, the shell is impacting the arc-shaped bright feature to the right. This object, known as G34.8-0.7, is an HII region – a pocket of gas that is being energised and ionised by the action of a nearby young, massive star. Traces of dust present in the HII region's gas are also being heated up, making it shine brightly at the shortest wavelengths probed by Herschel (70 microns, shown in violet in this image). Most supernova remnants either possess a glowing shell created by the ejecta as they sweep up interstellar material, or the remnant has a more diffuse, nebula-like structure that is usually powered by the wind of a pulsar – a spinning neutron star which originates from the core of the exploded star. SNR W44 is one of the few supernova remnants that overlaps between these two classes. It is therefore classified as a mixed-morphology supernova remnant. The expanding shell can be seen as the large violet bubble with filamentary texture occupying the left half of the image. As the shell blasts outwards, shock waves heat up the surrounding material, raising the temperature of dust particles present there to about 100 K. This causes them to radiate at the shortest of the wavelengths probed by Herschel. With a temperature of several million K, the hot gas inside the bubble gives off large amounts of X-rays. These appear in the image as the dark blue and light blue clouds that fill the bubble, and correspond to lower-energy (1.2-2 keV) and higher-energy (2-8 keV) X-rays detected by XMM-Newton. Herschel image of SNR W44. Credit: ESA/PACS/SPIRE/Quang Nguyen Luong & Frederique Motte, HOBYS Key Program consortium XMM-Newton image of SNR W44. As in other mixed-morphology supernova remnants, the presence of hot gas inside a shell that is expanding and cooling down is quite puzzling. One of the possible explanations is linked to the interaction between the remnant and its clumpy environment of gas and dust clouds. Dense and cool cloudlets from the surroundings could be swept over by the expanding shell and evaporate once inside it, due to the higher temperature, contributing to replenishing the remnant's interior with gas. Also visible in SNR W44 is the pulsar PSR 1853+01, which most likely derives from the core of the supernova's progenitor star. The pulsar, which shines brightly both in X-rays and radio waves, can be seen in the XMM-Newton image as the bright point source towards the top left of the remnant. The age of the remnant was estimated by measuring how much the pulsar’s spin slows down over time and is believed to be a relatively young 20 000 years. The pulsar drives a wind of highly energetic particles but this represents only a minor contribution to the remnant's X-ray emission. Two HII regions stand out in violet in the image, showing the intense activity of star formation in W48. These are G035.1387-00.7622 in the upper part of the image to the right, and G35.0-0.5 just to the right of the image centre. The bright flecks scattered across the image are denser clumps in the turbulent cloud medium and are the seeds of future massive stars. In the lower left corner of the image, the diffuse glow corresponds to emission from warm dust in the Galactic Plane, the disc-like structure that contains most of the stars and star-forming clouds in our Galaxy, the Milky Way. Additional details: W44 is a mixed-morphology supernova remnant, hosting the pulsar PSR 1853+01; visible in the image are also the HII regions G34.8-0.7, G35.0-0.5 and G035.1387-00.7622. The sources belong to the vast molecular complex known as W48.